Louis, a 5 year old male neutered longhaired dachshund presented the beginning of 2019 for acute paraplegia. After referral to a veterinary hospital for further evaluation he underwent a dorsal hemilaminectomy. Post hemilaminectomy Louis continued to be non-ambulatory and presented for evaluation to determine if acupuncture and related techniques would be of any benefit to him. During the course of his treatments he was able to regain the ability to stand for longer periods of time, walk a couple of steps, and the ability to hold his urine for longer periods of time. Louis, a 5 year old male neutered long haired dachshund presented the beginning of 2019 with acute paraplegia after jumping onto the bed. 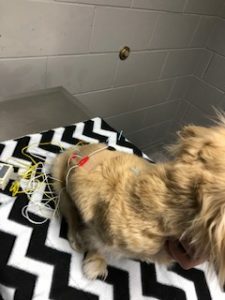 Louis was evaluated at a veterinary hospital after this acute event for a 12 hour history of progressive decline in neurologic function of his back legs. On presentation at the veterinary hospital Louis was non ambulatory in his hind limbs with normal forelimb mobility. No cranial nerve deficits were noted, conscious proprioceptive deficits were noted in both hind limbs, and weak withdrawal reflexes in both hindlimbs were noted. Louis was deep pain positive on presentation and did not show any discomfort on palpation of the spine. Louis was given a diagnosis of intervertebral disk disease. A CT scan was performed and identified extruded disk material in the L1-L2 and L2-L3 disk space on the right side. It was determined that surgery was necessary. A dorsal hemilaminectomy of L1-L2 and L2-L3 was performed by the veterinary hospital the morning following presentation. Following surgery and release from the veterinary hospital Louis continued to be non-ambulatory and also required bladder expression every 8-12 hours. Louis was sent home post-surgery on medications including codeine, trazadone and doxazosin. Prior to this event Louis has not had any other previous issues with back disease or any known traumas. Louis presented for evaluation two weeks post hemilaminectomy. On exam Louis is bright, alert and responsive in the exam room. His vital parameters are within normal limits. He is non-ambulatory in his hind legs with normal forelimbs. He is wearing a belly band because he has not yet regained bladder control. A neurological exam revealed normal cranial nerves. A withdrawal reflex was present in both hind legs but appeared to be weak compared to what would be expected as normal. A crossed extensor reflex was not present in the hind legs or forelimbs. Conscious proprioceptive deficits were noted in both hind limbs, the forelimbs were normal. A sluggish patella reflex was present in both hind limbs. Any sensation in the paraspinal area led to head turning and skin rippling. The paraspinal muscles appear to lack tone. It was noted during the exam that Louis had taut bands in the cervical spinal area. During examination of the front limbs both the infraspinatus and supraspinatus on the right forelimb were noted to have trigger points. On both hindlegs the hamstrings are lacking muscle tone. No additional diagnostics were performed on Louis given the short amount of time since his surgery. All previous bloodwork from the veterinary hospital was within normal limits. The problem list for Louis includes non-ambulatory paraplegia, paraspinal hyperesthesia, and decreased paraspinal muscle tone, decreased muscle tone of the hamstring muscle group, cervical spine tension, and trigger points of the infraspinatus and supraspinatus muscle groups. Differentials to consider for non-ambulatory paraplegia included ischemic mylopathy, hemgiosarcoma, a fibrocartilaginous embolism, an aortic embolism, discospondylitis, meningitis, osteosarcoma of the spine, fibrosarcoma of the spine, intervertebral disc disease, degenerative disk disease, myasthenia gravis, meningeoencephalomyelitis, diabetes, hypothyroidism, psoas fascia restriction, hemilaminectomy surgery and an injury from being dropped. Differentials to consider for hyperesthesia include fibrocartilaginous embolism, meningitis, spinal mast cell tumor, spondylosis deformans, syringomyelia, intervertebral disk disease, degenerative myelopathy, hemilaminectomy surgery, lupus, diabetes, thoracolumbar fascia restriction, and injury from falling. For Louis’s non-ambulatory paraplegia and hyperesthesia my definitive diagnosis is intervertebral disk disease with symptoms progressing due to trauma sustained from jumping onto the bed. A CT scan was performed at the veterinary referral center that ruled out all underlying spinal neoplasia and emboli. Recent bloodwork has been performed with no abnormalities noted that can rule out endocrine and metabolic causes such as diabetes and hypothyroidism. Due to his age I do not believe this to be a congenital abnormality. With this neurologic event having a very quick progression I feel it’s safe to rule out the more slowly progressing neurological disorders such as degenerative myelopathy at this time. Louis is not currently showing any kind of illness and therefore any type of meningitis can be ruled out. At this time we cannot rule out how much of an effect his hemi laminectomy surgery has on his current clinical signs however. 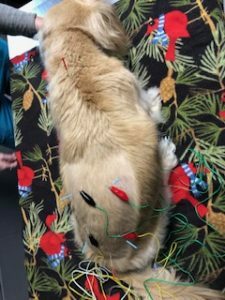 The goal with Louie’s acupuncture treatments were to increase his mobility, decrease his hyperesthesia, and increase his ability to urinate on his own. Based on his exam and patient tolerance it was decided to use acupuncture, electroacupuncture, and laser therapy. Electroacupuncture was chosen along bladder line points and bafeng points to help stimulate both sensory and motor function. Laser therapy was chosen to help treat the tension in the cervical area and stimulate healing in the lumbar and sacral area. Louis received one month of weekly to biweekly treatments. Louis was very needle sensitive therefore different points where chosen based on patient tolerance for that session. GV 14 was used as an autonomic point. Bladder line points were used near the hemilaminectomy area, the points included BL 21, BL 22, BL 23, and BL 25 along with outer Bladder line points. Bai Hui was used for lumbosacral pain along with neurological dysfunction. Bafeng points were used to stimulate nerve function in the pelvic limbs. BL 40 and KI 3 were used as tolerated for urinary retention. Electroacupuncture was used along the Bladder line and Bafeng points. Blue Seirin needles 0.20 mm by 30 mm in length were used with all electroacupuncture points, for all other points red Seirin needles 0.16 by 0.30mm in length were used. An ES-130 Ito e-stim unit was used for all electroacupuncture. The machine was set to a low frequency of 1.5 Hz for 15 minutes. 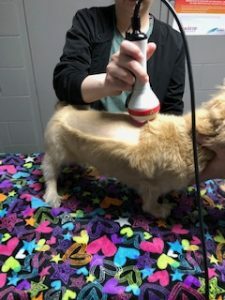 Laser therapy was performed on the cervical spine, lumbar spine and pelvic area. A companion laser machine with a 980 nm wavelength was used at a continuous wave setting for all laser therapy. Laser therapy was performed after every acupuncture session. At the end of Louie’s treatments he was able to stand, was starting to walk a few steps and had almost full bladder control. This case goes to show that acute injuries can be managed with acupuncture and related techniques. It was noted over the course of his treatments that myofascial restriction in the cervical and thoracolumbar areas diminished. His hyperesthesia also resolved and he was able to tolerate more needle placement towards the last 2 sessions. I believe that acupuncture helped Louie tremendously in his recovery, as did his owners. I do however believe that he would have benefited more if he would have also been involved in a physical therapy program in addition to his acupuncture sessions. I believe that he would have progressed more rapidly if this option would have been part of his treatment protocol. The standard of care for disk injury is up for debate at this time among veterinarians. According to the majority of veterinary surgeons disk injuries immediately need to be treated with surgery, however there are other veterinarians who can treat disk injuries more conservatively and still get the same results. I feel as if there is not a great standard of care at this time for disk injuries and more work needs to be done to set one. Jeffery ND, Levine JM, Olby NJ, Stein VM. Intervertebral disk degeneration in dogs: consequences, diagnosis, treatment, and future directions. J Vet Intern Med. 2013 Nov-Dec;27(6):1318-33.PubMed PMID: 24010573.